Gannett’s online data initiative has hit it big with online news industry types who are now itching to put up databased treats such as school report cards, crimes, property sales, public employee salaries and restaurant inspections. 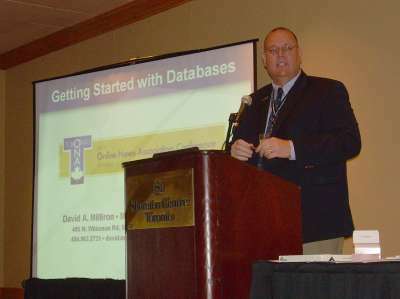 David Milliron, now at Caspio but formerly a data guru at the Atlanta Journal-Constitution, provided some insights on what’s needed to get a news organization started putting up great searchable databases. Of the many things about which Milliron spoke (getting advertising on board, worrying about server load), the thing that struck me the most was the need for getting educated the right way and having a solid network of other pros to lean on. When the crap hits the fan and your site goes down because of a bad query, it’s essential to have the “under the hood” knowledge of how the database and application work. That means understanding the programming language behind the framework, Milliron said. Furthermore, having a network of pros –whether its at your shop or otherwise–means you tap those other folks’ wisdom, have them give you great ideas on how to write good, efficient code and have them spot-check your work. For some without a mentor in-house, that may mean finding a local users group or joining a listserv (such as the ones offered by NICAR and other organizations). -Are there other people in your shop or at other shops in your industry developing with the programming language and framework you’re picking? -Can you get someone knowledgable to review your code? -If the person developing your applications gets hit by a train or hired away, will you be able to bring in someone else? -What are the costs and time associated with maintaining the database, not just what it takes to slap it up. Now if you want to get your hands dirty with code, Milliron suggests checking out your local community college or professional development programs for database classes. That comment struck me because yours truly has been going to a local community college since August to learn some honest-to-goodness programming (in C++ of all things). I can tell you that after banging my head against a PHP/MySQL book for weeks and making little progress, having a pro hold my hand through those concepts helped me build a useful PHP app for our web producers in about four hours. Creating interesting, functional, user-friendly databases is a big undertaking. Just don’t be afraid to get your hands dirty, and don’t fear failure. You will probably write a bad query, crash a server and have some whiz kid rewrite your 70 lines of code into seven. But if it means gaining the knowledge to build great apps, it’ll all be well worth it in terms of page views for your site, value for your readers and –most poignantly– your job security. This entry was posted in conferences, data, ona2007, web design. Bookmark the permalink.